The beginning of the end for U.S. District Judge Walter S. Smith, Jr.
On Tuesday, I launched DirtyRottenJudges.com and BoogerCountyMafia.com, both of which outline evidence of crime and misconduct against U.S. District Judge Walter S. Smith, Jr. Yesterday and today I was interviewed by a reporter from the Waco Tribune-Herald, and I am informed that the newspaper will be running a story tomorrow about Judge Smith. 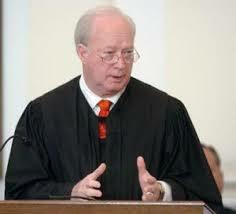 That will probably be the beginning of the end of Judge Smith’s judicial career, and it’s long overdue. On DirtyRottenJudges.com, I laid out the evidence that Judge Smith forcibly groped and molested a female deputy clerk in his private chambers. Other female employees have described incidents of groping and sexual harassment at the hands of Judge Smith, but this far none of them have gone public with their stories. I hope that changes soon. Meanwhile, this afternoon I received an audio recording of a telephone conversation between attorney Jeff Duke and Judge Robert M. Stem of the 82nd District Court of Robertson County, Texas. Earlier this week, I wrote about how Judge Stem tried to pressure Jeff to file a bar grievance against me, apparently because I had publicly exposed some of Judge Stem’s criminal activities. When you listen to the audio, bear in mind that Jeff had been an attorney for about a year at the time of the conversation with Judge Stem. It sounds to me as if Judge Stem was trying to get Jeff to do some of his dirty work. The madness will stop when these dirty judges,district attorneys and ex-district attorneys are outed and horns blown in their faces and everyone knows about their bad dealings. When will the madness stop? ?